← Total truth? Or is everything relative? 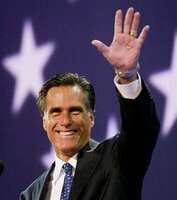 [Mitt] Romney is a Mormon Republican who’d like to be the next president. People are asking the question: Will his religion affect whether or not evangelicals vote for him? That’s a good question. But to many of us evangelical Christians in Utah who witness to Mormons, we think there are more important questions. Will this be an opportunity for the public to learn about what Mormonism really teaches? Will the doctrines of Mormonism be accurately portrayed? Will people understand the differences between Mormonism and Biblical Christianity?This video is more about Mormonism than it is about Mitt Romney. What follows is 32 minutes of insightful information about the official teachings of the LDS Church. Springboarding from an interview Mitt Romney did on the Charlie Rose show on 5 June 2006, the video discusses six specific issues related to Mormonism. Will Christ Appear Again in Missouri? Does God the Father have a Material Body? Does God the Father have a Father? Is the Great Flood the Most Unusual Belief in Mormonism? Presented in the form of interview clips, noted Christians involved in ministry to Mormons draw on documented LDS sources to answer these questions clearly and definitively; all according to official LDS teachings. The next section of the video is titled Ambiguity, Transition, and Diversity in Mormonism. Here is discussed the observation (based on the experience and research of the interviewees) that it is becoming increasingly more difficult to receive straight-forward answers from Mormons about the doctrines Mormonism advocates. Indeed, though there is a big difference between “folk doctrine” and official LDS doctrine, many Mormons seem to be unaware of that fact. Finally, the video winds up with a look at the question “Should Christians Vote for a Mormon?” Cogent information and perspectives are set before the audience, which gives viewers some tools and thought-provoking ideas to consider as they evaluate and answer that question for themselves. “Mitt Romney and Mormonism” is critical of the LDS belief system as it deviates from the Christianity embraced by the producers, but the information it imparts is accurate. It brings significant issues to light and thus is a valuable tool for those seeking answers to the “more important questions” we all should be asking. Hmm… If Mitt is open to talking about the most unusual thing about his religion, Noah’s ark according to Mitt’s own lips, then why does he refuse to talk about the things that are not as unusual to Mormonism, say like, Jesus coming back to Missouri or God having a material body and being fathered by another God? Another another note, Mitt said to the interviewer “You haven’t exactly got those doctrines right.” If she got them wrong, what exactly was wrong and why didn’t he correct her?